This is the only worldwide event which gathers together all beauty industry sectors. Producers from all over the world present a wide range of professional hair and cosmetics products at the exhibition. A wide variety of wellness and spa products of the best industry brands are also presented. 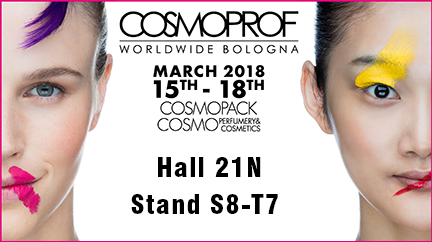 COSMOPROF gives a complete picture of the cosmetic market whose annual turnover is over 15 mlr. euros. The exhibition, whose area exceeds 80 thousand sq.m. will be attended by 2,590 exhibitors from 57 countries, 137,247 visitors - traders from 140 countries of which 30 477 foreigners and 800 accredited journalists. The countries which will take part in are France, Germany, Britain, Spain, USA, Australia, Israel, Argentina, Belgium, Brazil, China, Egypt, Greece, Japan, Korea, Poland, South Africa, Switzerland, Taiwan, Thailand and Bulgaria.